Our Jersey dairy cows roam the pastures of Carlton Farms 365 days per year. In addition to the grass that they harvest from the pasture, our cows also eat grass that we have harvested in the form of hay or green-chop (see Facebook videos for example). Naturally, we ensure that the cows have a consistent supply of fresh grass that has not been sprayed with pesticides or herbicides. We use no hormones or sub-therapeutic antibiotics. Our cows are milked individually in our three-stall milking barn. As each cow voluntarily comes into the barn to be milked, she is first given a scoop of feed. The amount of feed varies based on each particular cow and what her body demands are at that particular time, but the amount is always much smaller than a normal commercial dairy. On average our cows receive only about 5lbs of feed per day (commercial dairies often feed 30lbs per cow). We regard this feeding as a treat that serves to keep the girls calm and happy during the milking time. Before milking, each cow’s udder is washed throughly with warm water, sanitized, and dried. Sanitized milkers are then attached to the cow for a process of actual milking that only takes about 5-10 minutes. Our milking system is a former Grade A facility that uses a pipeline system. The advantage to a pipeline system is the rapid cooling of the milk. Our milk is cooled within 2-3 minutes of coming out of the cow. As the milk travels from the milking room to the adjacent “tank” room it passes through a micro-particle filter that ensures that the milk is clean. The milk is then bottled right out of the cooling tank as Raw Cows Milk for Pets. Nothing is ever added to the milk and nothing is taken away from the milk. Our free range hens spend their days picking through the pasture eating grass and whatever unlucky bug they may run across. The hens may also seek shelter from the heat in our custom designed chicken barn, which also houses their water, food and nesting boxes. They have the ability to go in the barn or out on pasture as they please. In addition to their natural diet of grass and bugs, our chickens receive a non-GMO feed that we grow here on the farm. Our beef cattle also roam our pastures 365 days per year. The beef cows are never given hormones or antibiotics, and only have a regular diet of grass... no feed. Of course we put up our own hay from our own pastures which obviously receive no pesticides or herbicides, that allows us to feed the cattle through the winter. Our cattle are slow growing cattle that take over 2 years to reach harvest weight, but they are worth the wait. Our animals are finished completely on grass with no "grain finishing" the way many farms do. Even our pigs spend their days roaming the pasture, or sometimes lounging in a mud wallow. We do provide them with a shelter so that they to can seek refuge from the heat, rain or wind. Pigs will eat some grass and roots, and also love to seek out acorns from the wooded areas of the pasture. However, like the chickens we do have to feed the pigs, as their digestive system is not able to survive on grass alone. We feed the pigs a locally grown non-GMO feed that we make ourselves. Free Range Turkeys are available during the thanksgiving season. These turkeys are raised on pasture and fed a non-GMO diet that we make right here on-farm. Turkeys are rotated onto fresh pasture every few days so that they are allowed access to plenty of forage and insects. We like to keep our egg laying hens for two years so that they can live a full life. They are allowed to molt naturally and we never withhold feed or use lighting to force molting. However, eventually their egg producing days are behind them. When that time comes, we process those birds and make them available for stewing hens. The meat is not suitable for roasting, but these birds make excellent chicken soup/stock. Their age adds richness to the flavor of the stock. free to enjoy the sunlight, fresh air as well as a smorgasbord of worms, insects, bugs & grass. They also have available to them non-GMO feed, which we grow for them here at the farm. If they want shelter, they can get out of the elements in their custom designed chicken barn. There they can nest, rest and drink fresh water. The chickens are moved every few days to ensure the freshest environment possible. 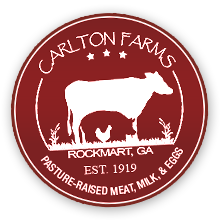 Our pastures never receive pesticides or herbicides of any kind, ensuring the best growing conditions for meat chickens bearing the Carlton Farm name. Our lamb is raised on pasture and fed exclusively mothers milk (for the first few months), and grass. The only thing different about our lamb as compared to our other animals is that it is only available seasonally. Lambs are born in early spring and harvested in mid fall. We have a great selection of lamb starting around November. The animals keep us pretty busy, so we grow a limited selection of vegetables here at Carlton Farms. However, we do work with several friends of ours that grow organic vegetables and fruits. These vegetables are available through our vegetable share program where you receive a box of vegetables each week, and a-la-carte on the mobile market at the Atlanta delivery locations. Working with other farms to provide vegetables ensures a more diverse availability than if we were only harvesting out of one field. There is a sense of community in the local natural farming world, and we like to embrace that community. We try to be the best at the things we produce, and we are proud to work with other farmers who produce things that we do not while using the same level of integrity.